"I have two black Vanguard Stereolab 'originals.' One mastered and processed by RCA, which was small Vanguard's 'go-to' mastering and pressing house (my copy was pressed at RCA's Rockaway, NJ pressing plant), and the other a Columbia mastering (1D/1J) that takes the warmth and turns it into muffled and somewhat distant. Neither copy can match the quiet surfaces of this reissue, which I consider to be essential for any 'well-rounded' AAA record collection." — Music = 10/11; Sound = 9/11 — Michael Fremer, AnalogPlanet.com. Read the whole review here. 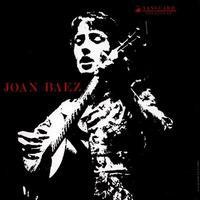 Although offered a recording contract with the major label Columbia, Joan Baez opted to sign with the independent Vanguard label, ostensibly to retain artistic licence. Recorded over the course of four days in a ballroom of a hotel in New York, her debut album is noticeable for its sparseness, featuring little more than Joan on guitar and vocals, with some tracks featuring a second guitar. Released in November 1960, when she was just 19 years old, the album would finally chart in 1962 when her second album had begun to attract major interest, and would go on to attain gold status.